Roman coin: silver denarius of Titus (AD 79 to AD 81), dating to the period AD 80 and later (Reece Period 4). 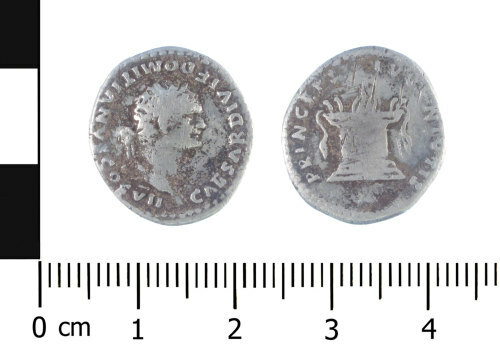 PRINCEPS IVVENTVTIS reverse type depicting an altar garlanded and lighted. Mint of Rome. RIC II, p. 122, No 50. (RIC II Part 1 Second Edition No. 266). Obverse description: Bust facing right, laureate. Legend retrograde.